Lasagna is one of those foods that top favorite foods lists and so I came up with baked zucchini lasagna to help lighten this classic. My son, not unlike Garfield, hasn’t met a lasagna he doesn’t like. Honestly, the kid could eat his own tray of the stuff if we let him (always trying to get him to eat his salad before he can have seconds, thirds, etc.). I decided to update my lasagna because of him. My first idea was to drop the noodles and use zucchini instead since it is much lower in carbohydrates and calories (and I had seen many recipes for this version in lighter cookbooks). I had to agree that it got too watery because the zucchini “noodles” released all of their liquid while cooking and it got a bit soupy. Also, the dish is so iconic that it is hard to replace the pasta without turning it into something else. I went back to the drawing board (or in my case the kitchen counter) and designed a lasagna without meat and one layer of zucchini. Miraculously, my son didn’t notice the zucchini and I had a hit on my hands. 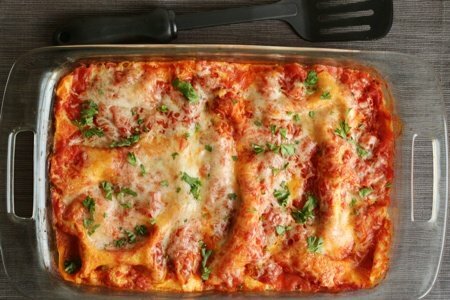 This isn’t going to win a “healthiest casserole” award but it is an improvement over the calorie bomb that is normal lasagna. I make two of these at a time and freeze one for a later meal. I love cooking in my 9x13 casserole dish. Everyone has one and so I feel like this type of recipe is really accessible..
My Mexican Zucchini Boats are another wonderful way to use zucchini to lighten things up. Last week, I shared my zucchini breakfast muffins and they were well received. Gotta love zucchini – it is so versatile and affordable. reprinted from Snack Girl to the Rescue! Mix the ricotta, Parmesan, and egg in a small bowl. In another bowl, combine the tomato sauce and diced tomatoes. Pour 1 cup of the tomato mixture into a 9 × 13 × 2-inch casserole. Layer all of the zucchini slices over the sauce. Dollop half the ricotta mixture over the zucchini and top with another cup of the tomato mixture. Cover with 3 pasta sheets and spread with the rest of the ricotta mixture. Add 1 cup sauce and top with the remaining 3 pasta sheets. Top with the rest of the sauce and cover with grated mozzarella. Cover with foil and bake for 40 minutes. Remove the foil and bake for another 10 minutes to finish melting the cheese. After taking the lasagna out of the oven, let it sit for 5 to 10 minutes to firm up. I have made lasagne with only zucchini for years. My husband and I prefer it over the pasta version. I just bake it longer to let some of the excess liquid evaporate. So good! I thinly slice,season and roast my egg plant and zucchini before I put it into my Lasagna. so how can I avoid the problem? @Frances -I am my own food photographer! My experience is that it doesn't get soggy as the liquid is soaked up by the noodles and cheese. If you give it a try let me know how it goes. Hmmm this dish looks yummy. I will definitely try this recipe especially for my son he is not a veggie person. I have so many problems with cutting the zucchini! It's difficult for me, any suggestions? Invest in a mandolin kitchen tool it will help with any slicing job and much faster too! but it calls for 6 noodles for 2 layer- did that really fill a 9x13 like you wrote about, I would think it would do an 8x8 better? Or need 8-10 noodles sheets for the larger pan?? 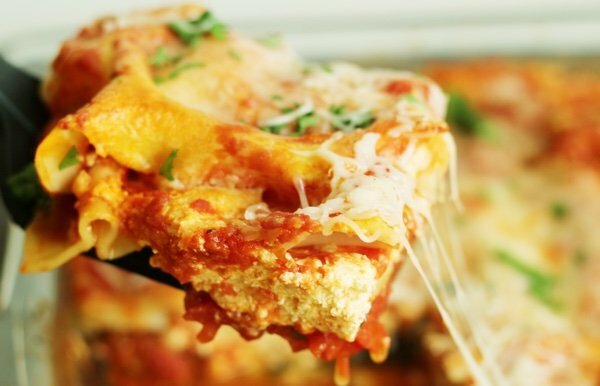 Suzanne Somers used eggs instead of noodles in her lasagna recipe making it completely carb free. Layer egg - (cooked like a thin omelettes) instead of noodles - you cannot tell the difference. 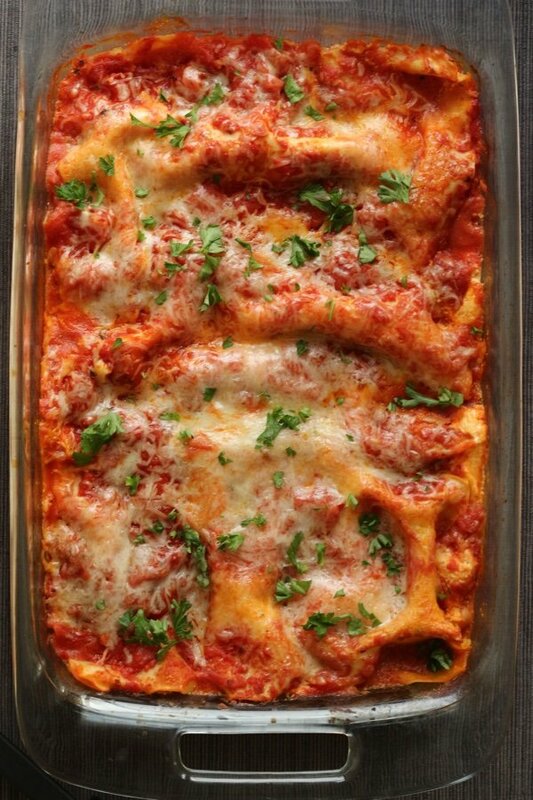 I continue to make lasagna like this to this day. YUM! Great recipe. As for zucchini and eggplant, it is best to slice what you want and salt the pieces generously for about 30 minutes. Then rinse with fresh water and pat dry. This will remove excess moisture and prepare your veggies for cooking without a lot of excess water and it removes the bitterness from eggplant. Looks great/ I will try this...also I will try to figure how to do it with omelette-like noodles. thanks for all you do! I tossed my Mandolin slicer, I cut my hand on it. I will just have to use extra care to cut my zucchini and egg plant thin.